Real men eat quiche! Anyone, and I mean anyone, will love this recipe! 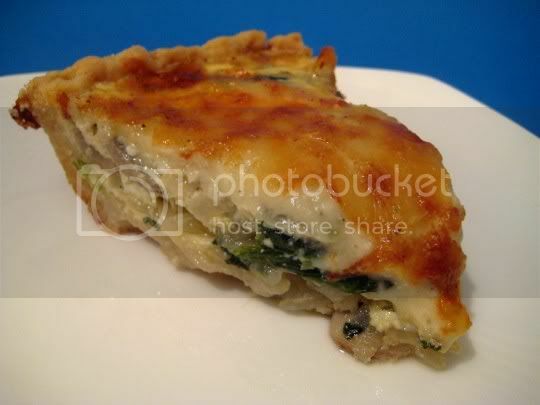 Rich, creamy, cheesy, sweet and savory, and hearty, with a flaky crust. This variety of quiche contains mushrooms and spinach, but it's the mouthful of gooey, browned cheese that will knock your socks off. It's relatively easy to make. Onions, mushrooms, garlic, and spinach are sauteed for the veggie mixture. A word of warning: drain this mixture VERY WELL before spreading in the crust. Spinach gives off a LOT of moisture when cooked, and if not properly drained, the mixture will be very wet (and this will make for a very wet quiche in the end). Next, whisk together eggs, milk, Dijon mustard, and salt and pepper. The amount of pepper may seem to be a lot, but trust me, it will be perfect. Pour that over the veggies, and top off with a couple handfuls of grated Gruyere (yum). The crust the mixture is spread in is very easy to make, but make sure you gather any extra crust for the edges...otherwise, you'll end up with a thin edge (like I did) and the egg mixture will spill through. Bake for 45 minutes, until the quiche has a rich golden brown color. Let it set for as long as you can hold out, maybe even until it reaches room temperature. This will allow a better texture, and better flavor too! The onions provide a subtle sweetness, and that Gruyere provides amazing saltiness and ooey-gooey ness. After all, who doesn't like cheese? Make again? Definitely. Maybe even throw in a little veggie ham or turkey next time. Oh, and I've gotta make sure my crust is hole-less!